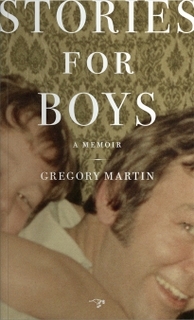 Stories for Boys is Gregory Martin’s second memoir to examine the landscape of family. His first, Mountain City, maps his ties to a one-blink town in rural Nevada: the book is steady, spare, and clear-eyed. But the focus of this new probing—an interrogation of fatherhood back-dropped by shifting cultural mores—is closer, more jarring and fraught, and, for its risks, more lucid still. Martin is the father of two sons, but the call to the hospital that begins this book welcomes not another newborn, but an awakened father. Or, to borrow Martin’s metaphor, a father unearthed. Either way, the suicide attempt was not altogether unsuccessful: the man Martin knew, or thought he knew, is gone. Or at least his secrets are, and their revelations overwrite Martin’s memories and reverberate into the relationships he shapes with his own sons.